Many, many moons ago, I met Lori Kamler when I started working for my current employer. Lori hates it when I tell this, but here goes anyway. Lori was rough around the edges, knew her job, but lacked confidence to really excel, and could hardly run more than a mile. Lori found out I was a runner and began peppering me with questions about the sport, how to train and giving me copius updates as she began running lunchtime workouts. “hey Jeff, I ran two miles today!” was the content of many an early email I would receive. Time went by and eventually I convinced her to sign up for a race and challenge herself. The distances increased, moving up to half marathon and then the full marathon. I had the distinct pleasure of pacing her to a finish at her first marathon at the LA Marathon. From there the insanity continued, marathon after marathon. The Lori I had met back in 1998 was now a completely changed person. Focused, fit, confident and hands down the best asset that our company had on it’s roster. But then she got nuts. She stepped into the insane and obsesive world of triathlon; sprint, olympic and then up to the half iron distance. She began racing some life changing events and her confidence grew, along with her fitness. Fast forward to 2008 and Lori got the wild hair to sign up for Ironman Arizona 2009. 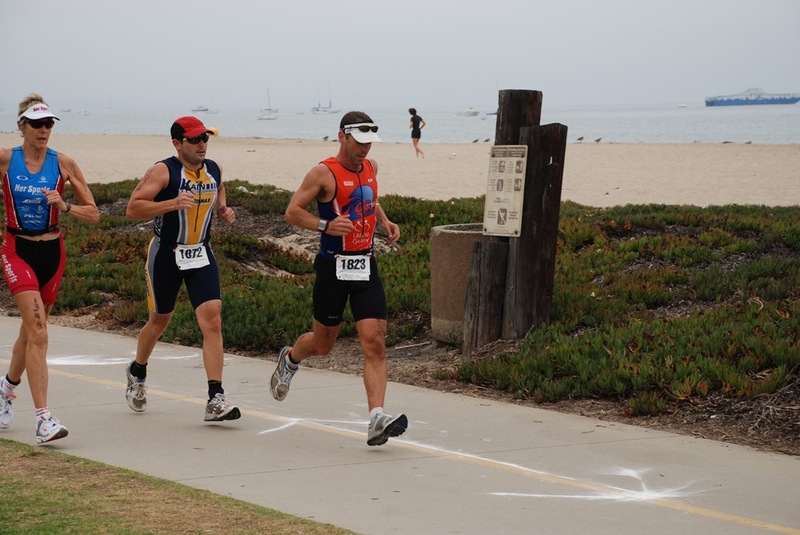 For the uninitiated, an ironman distance race consists of a 2.4 mile swim, a 112 mile bike and then, once you completely exhast yourself with those two legs, you GET to run a full 26.2 mile marathon. The enormity of this undertaking is mindbogglingfor the layman. Completing an ironman only comes after years of conditioning your body for endurance events and typically a year training cycle specific to the race. It is tough physically and mentally and requires hours of intense training, rest and the support of family and friends. Ironman is an emense undertaking. And this is what Lori as signed up to complete on this brisk November morning in Tempe, Arizona. The weather is in the mid fourties at the start, the water temp is hovering around 60 and the high for the day should be in the mid 70′s; a perfect day for a race. As Lori makes her way through the day, I will post updates and any media I can get. 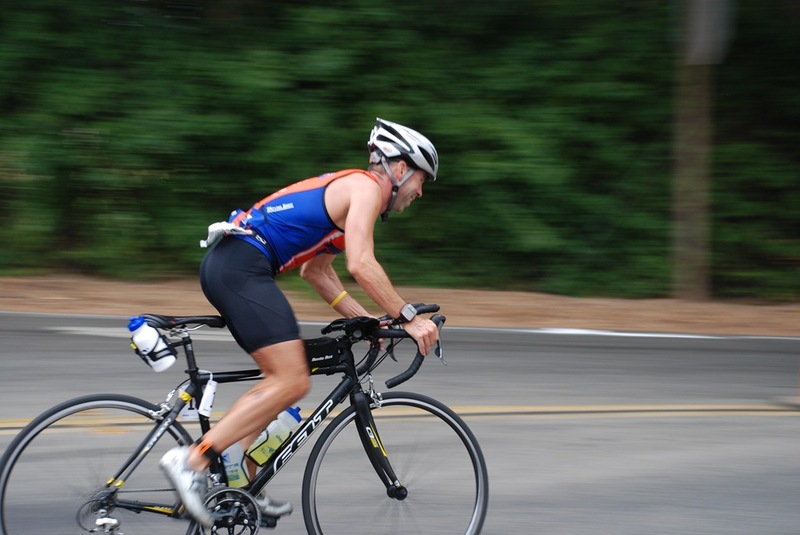 Join me in cheering on Lori Kamler, rock star and future Ironman! The racers are on their way. Age groupers [the non-pro athletes] started right on time at 7:00. The water was COLD, but the air is colder! Lori should hit t1in about 2 hours. Next update from the swim to bike transition. Lori is out if the water right at 2 hours. She looked great and I got a wet high five and a huge smile. Many of the athletes were commenting on the water temperatures and looking hypothermic, but Lori looked fresh and wash focused and all smiles. Onto the bike! Lori has been out on the bike course for a little over three hours now and is starting on her second of three 37 mile loops. The bike course leaves Tempe Town Lake and heads up highway 87 to Shea, a long, mild climb for over 18 miles before turning around to be rewarded with a gradual downhill. The temperature has climbed into the high 60′s, but sun is shining fiercly. The important thing for these athletes on this leg of the race is to use the bike platform to get hydrated and fueled for the upcomming run, all while maintaining effort to successfully finish the bike. Lori will be on the bike for over seven hours in the desert sun. That is a long time to be riding and poses it’s own set of difficuliltirs when transitioning to the run. Surviving the bike takes consistent focus and effort. Lori’s husband reports seeing her on her third loop of the bike course, indicating that she’s maintIning her desired 15mph pace and looking to transition onto the run around 4:30pm. Lori hit the last turn around on the third loop right at 3:30pm. She’s holding to a solid 15mph pace. She said that she was tired, but the remainder of the ride is downhill so she should be able to recover over the next 18 miles. Dana saw Lori enter t2 right on schedule. She’s still tired, but the run is her event and she’ll be great once she settles into her pace. The transition from bike to run is tough. After being in the aero position for over seven hours, the body can be really stiff and it may take several miles befor the legs an back loosen up to where you feel like you can run normally. Durring training, triathletes will practice this type of transition to prepare themselves for this sensation. Lori is well aware of how to handle this. As she eases into the run, it is important for her to keep drinking fluids and eating to keep her muscles fueled and limber. Lori just passed the four mile mark after just under an hour of running. Her pace looked like she was running about an 11min mile, so she must have wisely walked the first couple of miles and she looks to have settled into her comfortable pace. Lori passed Danna and I just after mile 12 and stopped for a brief chat. She complained about shortness of breath and was concerned about making the mile 17 cut-off at 10:15pm. We talked her down off the ledge and let her know the time and re-assured her that even walking the next five miles would put her at 17 before the cut-off. She was relieved. She returned to her old self when I commented that she looked like an alien with the chemlites on her belt and she shot me two birds. She’s going to rock this thing! Mile 17 and Lori hit it right on pace for a six hour marathon. She crossed at 8:55, well before the 10:15 cut-off. She was tired, but hammering out the miles. Danna and I caught Lori again at mile 20 and while most other athletes were walking, Lori came around the corner running and kept going. She could taste the finish at that point and I don’t think anything will stop her now. She looked so much better at 20 than she did at 17! well, this week kicks off the start of some big summer plans. well…mainly for the month of june, but depending how this month goes, the rest of the year might end up being a whirlwind/rollercoaster. 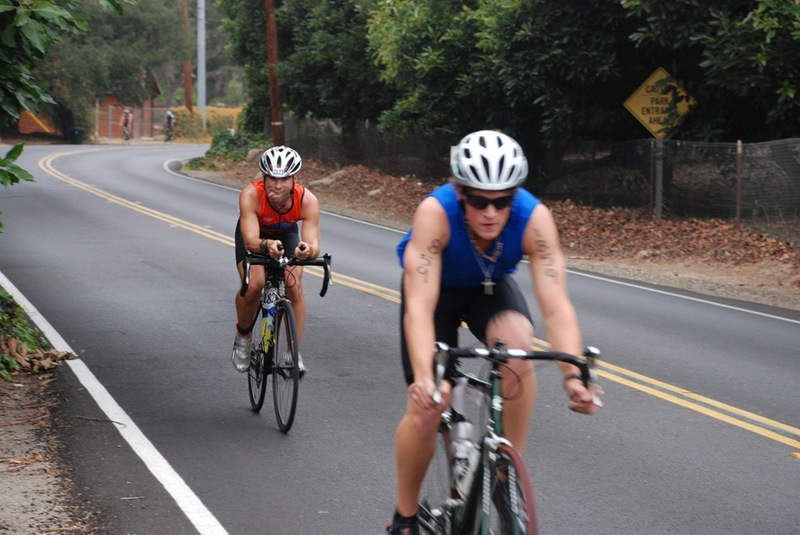 friday, i head off the east coast to hook up with flipperhead, warren and bill for a little triathlon fun. bill, warren and i are all racing mooseman 70.3 this sunday. flipper had planned on racing as well, but with a recent injury and starting a new career she didn’t think she’d be up for the distance. that’s okay, her moral support will be most welcome and i know we’ll talk her into something equally or more crazy in the near future. as for the race, i’m excited. i don’t think i’ve trained as hard as i did for wildflower, but i’m not as anxious as i was for that race, either. i have a big goose-egg for open water swims and my longest ride this year has been 40mi, but i still feel good. i’ve had some pretty decent brick workouts over the last few months, so my confidence is still high. i’m not sure what my goals are for race day, though. i think i’ll gauge how i feel race morning and either determine to race hard or just enjoy the day [actually, either way i’ll be enjoying the day]. the race is this coming sunday, june 7th, so if you’re home and on the internet, stop by their website and check out the live internet broadcast of the race. my bib number is 285 and i’m in the second/day-glow green wave, departing at 7: 04.
following the race, i’ll be hoofing it over to manchester, uk for another work trip. i get to spend a weekend in country and am hoping that i can swing a trip to the peak district to get in some fun trail running. the little taste that i had last year with bill really has me wanting to do something in the 20-30mi range this time around. then, i come back. and this is where the REAL fun starts. upon my return to the states, i’ll be heading up to the yosemite area to stay with the in-laws for a few weeks. they recently put their house on the market and decided to buy a retirement place up in coarsegold [just outside of yosemite’s south entrance]. for those few weeks that we’ll be staying with them, i’ll be participating in a trial run with work to determine if i can work remotely on a permanent basis. also, while in coarsegold, we’ll be looking at real estate, quality of living, schools, etc and if we like what we find AND i get the green light from work to tele-commute, we’ll be pulling up stakes too and setting up camp in the foothills of the sierras. so, if that all pans out, then the rest of the summer is going to be nuts-o with moving and whatnot. so, lots of big stuff happening. i’m excited and anxious for what june holds! oh, my poor blog. you poor, poor neglected blog. you’ve been beaten in the past several weeks, and i haven’t even stopped by to even drop a gratuitous post on your fair front page. how will you ever forgive me. so, things have been busy lately. breakingthetape.com [or, lovingly referred to as btt] has been taking up quite a bit of time these days. we’re working hard at a front page overhaul, a technology overhaul and standardizing scripts/reports and gadgets. in the midst of this, the btt blogs blew up and i was forced to attempt a blog platform upgrade that introduced such technical complexity with modifying the templates that i lost a couple bloggers. that, though, i completely understand. hosting blogs on btt started out as a kinda cool way to give back to the community, but with several high profile blogs on the site, the server was taking huge hits due to all the comment spam that it had to deal with. ugh. so, big changes there and lots of coding going on in addition to running 20+ milers on trails in the wee hours of the morning, a 17mo old behemoth baby that is learning animal sounds and how to run and the full time job with a challenging workload…well, the all conspire to make the blog feel a little neglected. but, just because nothing is being posted doesn’t mean that groovy things aren’t happening. i’m currently testing product for mission, tech40 and uk gear which will result in some interesting product posts. also, next year’s race schedule is currently in development. so far it’s looking like a great blogger event in new hampshire next summer for some moose love, an early season half iron in my backyard and an inaugural half iron that ends in magic mountain. can you say, "race day magic"? i thought so! so, stay tuned for fun training stuff and if you’re lucky, i might slip in a video of tc bawking like a chicken. the thing that stood out most about the drive up to santa barbara this year vs. last year was the weather. a marine layer dominated the sky and was just beginning to burn off when we arrived at around 1pm. "if that could hold through the weekend", i thought, "it’d be great weather for the race." saturday dawned cool and overcast and as the sky began to lighten, i was already at the transition area with my gear completely set up and ready to rock. lesley, who was racing the following day in her first sprint, waited with me while my start time grew closer. we joked around about how hard it is to cheer for people with normal names at large races. yelling "john!" or "eric!" might not get the same response as someone named "zipper". if your name was zipper, you’d know if someone was trying to get your attention. i also mentioned that in the family reunion areas at large races i always tell my crew to meet me at the letter "q". the "s" area is always jammed. so, i guess the ideal race day name would be something like "zipper quigley". my wave was scheduled to start the swim at 7:09 and i was suited up and ready to swim with plenty of time to spare. as my wave prepared to swim, i positioned myself in my customary location; outside left, toward the back. the swim is my weakest discipline and the chaos of the pack always un-nerves me. the horn sounded and we were off. i ran down the beach, waded into the surf, waited for a wave to crash and then dove in. i quickly had my face in the water and began focusing on my stroke. i also quickly realized that i was in the middle of my wave, not to the outside, and definitely not at the back. as we rounded the first buoy, i took stock and noticed that i was, surprisingly, comfortable. my heart rate was fine, i was swimming with a really powerful stroke and i was right in the main mix of my wave and not bothered by the kicks and bumps. i found a guy that slowly swam past me and tucked right in behind him. i was able to draft off of him for the whole swim. i took a couple kicks to the face, but nothing that messed with my goggles. the great thing, though, was just how comfortable i felt in the middle of all that chaos. before i knew it, we were back in the surf and i was running up the beach. goggles on head, unzip the suit, strip to the waist and head into t1. the transition was seamless. the suit came off without a hitch, helmet on, shoes on, grab the sunglasses and bike and i was off. the bike course is tough. there are some challenging climbs that are single digit speed steep and the resulting downhill sections are technical with sharp, steep turns and incredibly poor road conditions. i pushed hard on the bike, making sure i didn’t fall asleep at any point and always at the height of effort. i was able to pass a significant number of people on this leg, and the thing i noticed this year vs. last year was that most of the cyclists were in my age group. 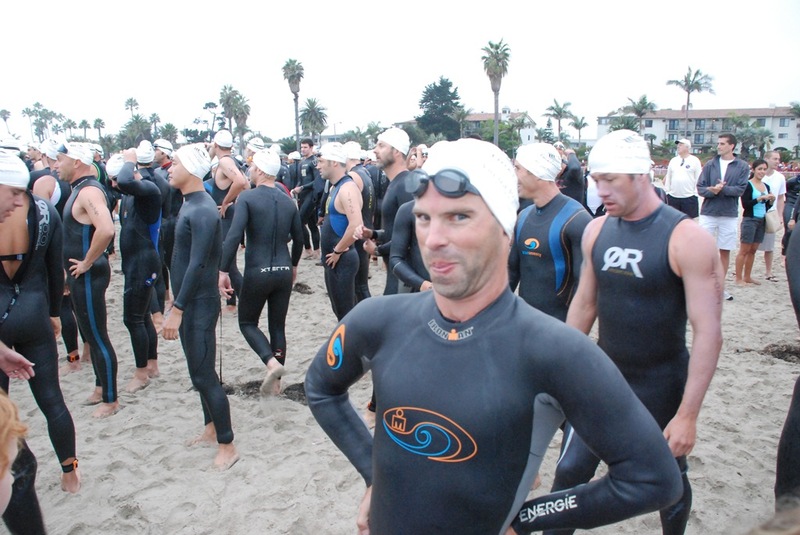 in races past, i usually end up coming out of the water a wave or two behind mine. not this time. i was still right in the mix. on one of the main climbs, a car [the course was open] came up on my left and i heard the ringing of cowbells and shouts of "zipper quigley!" it was kevin and the kids. lesley had relayed my race day name joke and now the kids were using it to cheer for me. what a great boost of energy and motivation. our host family is the BEST at race day crewing. at one point, a guy in a kain jersey passed me up [with a 35 on his calf], cut right in front of me, turned around and gave me the "lance" look. excuse me? i wasn’t sure what that was for, but i backed off, got out of his draft zone and picked it back up and passed him on the next climb. this went on for a while, with the two of us yo-yo’ing back and forth. eventually, i passed him and didn’t see him again on the bike leg. the bike leg went by pretty quick and before i knew it, i had hit 30 miles and was on the home stretch. i rolled into t2, ditched the shoes, slipped on my running shoes [now with yankz! ], grabbed my visor and was off! i ran down my rack, headed toward the run exit when a yell of "helmet! helmet!" caught my attention and i realized i still had my helmet on. duh. i turned around, ditched it and waved a thanks to the folks who had clued me in. feeling like a dolt, i headed out onto the run. within seconds, i found myself running up on "lance". 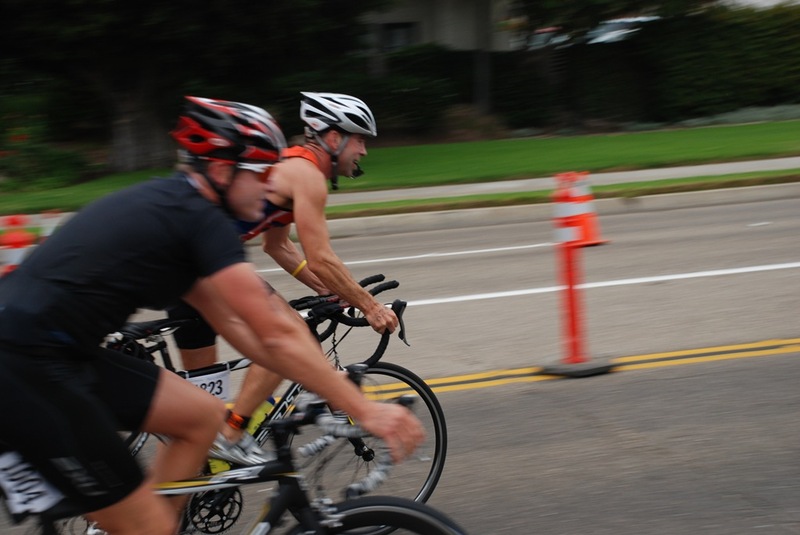 i settled into a strong, but comfortable pace, blew past him and didn’t even give him the courtesy of a glance. that loss of 20-30 seconds with the helmet must have let him get ahead of me, but i wasn’t going to let him pass me again. my legs felt quite good on the run and i didn’t have the stomach problems that had plagued me last year. gotta hand it to racing with proven fluids and fuel. i ran a comfortably fast pace, handled the climb up onto the bluff without any difficulty and before i knew it, we were at the five mile turn around. as i climbed back up to the bluff, i saw "lance" again, a couple minutes behind me and looking like he was really struggling. i put on a happy face and ran past him moving fluidly and confident. i picked up the pace a bit on the way down off the bluff and pushed a bit on the run into the finish. my run pace wasn’t flying compared to what i’ve done in just running races, but i was happy to be keeping about a 7:20 average for 10 miles after 35 miles of other disciplines. i came across the finish line smiling with a pr-busting 3:29:17, a full 16 minutes off of last year’s time. i was over the moon with my time, and i felt fantastic. like i said previously, i may have been in better tri-shape last year, but i FELT better this year, and that made all the difference. when i looked at the splits for the race, i was surprised to see that i had dropped five minutes on each of the disciplines and the last minute was attributed to faster t1 & t2 times. 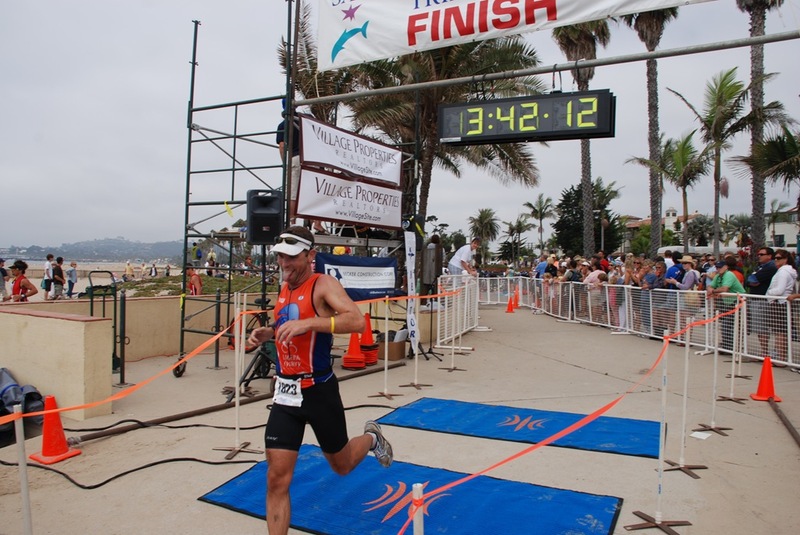 i’ll have to say that this year’s santa barbara tri was my best tri performance to date. i can’t wait to challenge my pr next year! no fail whale for our hero! with the santa barbara tri coming up, i felt it was of the utmost importance to get in a really long, solid brick this weekend. this week has been a pretty hefty week for training, so to cap it off with a nice bike/run would be perfect. i set the alarm for 4am saturday night and actually woke up a couple minutes before it went off on sunday. i forced myself to sit up and that was all it took to let the bladder take over the process of keeping me awake. i ate, staged gear, got all my fluids and fuel together and was out the door a little after 5am. as i hopped on the bike, i thought for a second about going back inside and getting my tire levers. i waffled for a second and then popped back inside to retrieve them from my pack. off i went! the plan was for a long clockwise loop through santiago canyon. the route includes a speedy, flat section along irvine blvd on the way to the climb at jamboee, several challenging climbs through the canyon and then a long, fast 10ish mile downhill back to the house. as i headed out toward irvine blvd through the pre-dawn darkness, i felt sluggish. riding was hard. everything felt difficult. yeah, i had put in some hard workouts during the week, but that wouldn’t make me feel THIS bad, would it? at 2.5 miles into the ride, i just plain felt flat. and then i realized why. my rear tire had been loosing air and finally gave out. duh. i patted myself on the back for getting the tire levers as i quickly changed the flat and hopped back on the bike. amazing the difference a fully inflated tire makes. the pre-dawn dark gave way to a marine layer grey sky, but as i climbed up into the canyon, the fog gave way to a brilliantly blue sky and a bright sun. i cruised along in the sun, enjoying the cool temperatures and tackling the hills without much difficulty. at the top of the final climb, i shifted high and really dug into pushing it as hard as i could on the downhill. it was great to fly, nearing the end of my ride as most cyclists were just starting their ride and climbing the first of many hills. back home after just under 39 miles, i switched into my shoes, grabbed a fuelbelt and headed out for a the run. i planned just a simple out and back along the paved san diego creek trail. the run portion of santa barbara is all paved, so i felt i needed to get some more road under me. i set out with a goal of just enjoying the run, keeping a pace within myself and not pushing so hard that i wouldn’t have any energy left for the rest of the day. at the 5 mile turn around, i snuck a quick peek at the garmin and saw that i was comfortably below an 8min pace. woohoo! i kept focused on my form and staying relaxed while continuing to put fluids in my body. i ran the returning miles home feeling, for the most part, comfortable. i could tell i was getting a little tired by the time i hit mile 8, but i really felt like i could have cranked it up and really hammered the last miles if i had desired to do so. i rolled back home and finished the 10+ miles with an average pace of 7:44. woohoo! i had just completed about 50 man powered miles! successfully putting in a workout longer than the race course is a great confidence builder. i can’t wait to race in a couple weeks. it’ll be my first tri in a year. i’m not sure if i’m in better conditioning than last year, but i FEEL good, and that’s more important than anything.